For decades California prisons put people in solitary (Security Housing Units, or SHU) indefinitely, solely on a guard’s designation of a prisoner’s status as a gang member. The SHU filled up with prisoners who were never to get out unless they implicated others (“snitch or die”). A settlement, announced on Sept. 1, of a class action lawsuit, Ashker v. Brown, abolished “status-based” solitary. All SHU terms will now be determinate and only for specific behavior while in prison. There are over 3,000 prisoners kept in solitary confinement in California, over 850 for over 10 years just in Pelican Bay! This despite international recognition that solitary confinement of longer than a few weeks is a form of torture. An important beginning was the historic 2011 hunger strike, which brought to the world’s attention the torture committed in U.S. prisons. The prisoners worked hard to overcome the racial enmity fomented by the guards who ramp up racial hatred. The “short corridor” at Pelican Bay State Prison was designed to isolate the unbroken prisoners from even their own racial group. The men of the short corridor, however, created, out of their proximity to their prison-designated enemies, an opportunity to overcome those divisions. When they called for outside support for their hunger strike, they expressly requested that images used in publicity include all races. The logo (see graphic, p. 10) they created for the strike was of hands of all colors grasping each other. California Department of Corrections (CDC) reported that 6,600 prisoners participated in the first hunger strike. Over 12,000 participated in the second hunger strike, Sept.-Oct. 2011. In 2013 the prisoners called for another hunger strike; this time CDC admitted that there were over 30,000 who participated. Prisoners’ inspiring non-violent action shined a light on torture committed right in the U.S. as public opinion turned around with condemnation in the mainstream press, even statements from Sen. John McCain, held in solitary as a POW in Vietnam. The prisoners convinced their families to support them publicly. Some family members worried that if they spoke out the CDC would retaliate against loved ones inside. The families came to understand that it was the prisoner’s choice to join the hunger strike, that they were doing it for everyone. 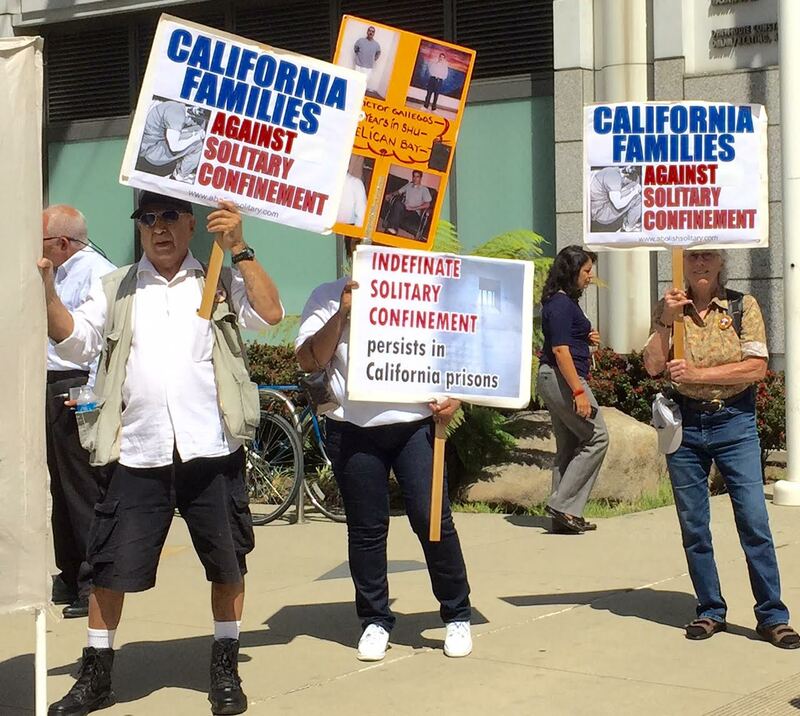 From left to right: prison activist Bato Talamantez, a family member of Victor Gallegos, and Penny Shoner stand up for California Families to Abolish Solitary Confinement during the Sept. 1 announcement of a settlement ending indeterminate use of solitary in California. Families Against Solitary Confinement (CFASC) is a new, eloquent dimension of the movement expressing the thoughts and feelings of those they love to the media, legislators, courts, and especially in support of each other. Partly because the families’ voices were so powerful, the movement spread. Lawsuits were filed. Many demonstrations, talks, community events, teach-ins, etc., were held throughout the state. Following the lead of the prisoners, CFASC organizes across racial lines. In 2012 the prisoners, determined to continue the fight, came out with an historic Agreement to End Hostilities. It called on prisoners to not allow the prison to set one group against another. What is exciting about the movement is prisoners acknowledging each other’s humanity. The prisoners are not asking to be set free, they admit that some did terrible things. The movement does not seek spectacles or stop at confrontations with authorities. It seeks to change the minds of ordinary people. There are many different voices within and supporting the Prisoners’ Human Rights Movement. Many groups participate in the actions on the 23rd of each month. There are more documentaries, more plays like If the SHU Fits, more vigils, prayer meetings, demonstrations not just across California, but all over the country—Boston, Philadelphia, etc.—and even international support from Mexico, Guantanamo and Palestine. There are still those who want to get legislation through, starting with banning putting minors in solitary. The settlement of the class action lawsuit is but one venue, one expression of the movement. Now that hundreds of prisoners long held in the SHU are being released from solitary, there are mixed reactions. On the one hand, the relief, gratitude and flowering of those who can at last see the sun and have a first contact visit is overwhelming. On the other hand, guards have not been a party to the settlement. Some are predicting a dire rise in violence and doing everything in their power to cause prisoners to explode. They “accidentally” open doors to cells housing prisoners whom the guards deemed enemies of each other, expecting them to fight. They have not. At Pelican Bay SHU the so-called “wellness” checks have become torture as guards open the loud metal doors to each unit, stomp through the hallways, bang metal batons against the metal doors, etc. (see “California prisons’ punitive ‘wellness checks,’” Sept.-Oct. 2015 News & Letters). Prisoners there have been deprived of sleep for over two months, increasing stress levels and health problems, including thoughts of suicide these checks are meant to prevent. There are some hints that attitudes among guards may be changing. We heard reports of administrators and some guards looking forward to receiving prisoners who have been released from solitary. They know it will have a calming effect in their prison, as those prisoners have a great deal of credibility and they are serious about the Agreement to End Hostilities. • All hunger strikes were rough to participate in. But it was a fight we had to take. • My colon collapsed during the hunger strike. I have a colostomy bag now and can’t sleep because I can’t get meds to keep my gas under control, but it was worth it! • The hunger strike created a bond between prisoners. The Agreement is holding in the SHU, no incidents. I dropped my prejudices. The guards were sure that when they let Nortenos and Surenos out on the yard at the same time, they would fight each other. But they don’t! • I’ve stayed in the SHU because my moral beliefs (not debriefing) are precious to me. The media (PBS documentary “Solitary Nation”) is focusing on how solitary victimizes people: cutting themselves, etc. I do see strong men break—we are buried alive in here. But we are not all like that. We are very sane, we have self-respect. • When you’re in prison, you change. I tried to stay who I was before I came here. But I was young, self-centered. After all this time you no longer think just of yourself, but all the others, too, including those outside and those who will come here after you. • The hunger strike humanized prisoners. My family and others got a whole new outlook on the criminal justice system. Many young people make bad choices and California throws them away. People aren’t born with the tools to be good parents and make good decisions. Does that mean you don’t value those people and put them in SHU for 30 years? We got time to think. The Agreement to End Hostilities gave us power. When prisoners come together as people, we are much stronger. The principles that make it possible for prisoners to resist CDC’s pressure to tell on others are the definition of what it means to live life as a human being. It is a recognition that my every individual act is at the same time a social act; that even in the most dire circumstances, I don’t forget that I live as a social being, a human being. That new concept of what it means to be human is what enables prisoners to resist the guards’ current efforts to worsen conditions. By resisting forced isolation, prisoners re­established their connection to one another and asserted their essential humanity. That is a beginning of a revolutionary reorganization of society. This entry was posted in Articles and tagged Agreement to End Hostilities, Ashker v. Brown, California Department of Corrections, California Families Against Solitary Confinement, California prisons, CDC, CFASC, criminal justice system, Danny Troxell, Gabriel Reyes, George Franco, George Ruiz, guards, Hunger strike, If the SHU Fits, John McCain, Luis Esquivel, Marxist-Humanism, Paul Redd, Pelican Bay, prison guards, prisoners, prisoners' families, prisoners' human rights movement, racism, Richard Johnson, Security Housing Units, short corridor, shu, Sitawa Nantambu Jamaa, snitch or die, solitary, Solitary confinement, Solitary Nation, Todd Ashker, torture, Urszula Wislanka, validated as human, wellness checks. Bookmark the permalink. Your article on the front page of Nov/Dec N&L is spot on and it warmed my heart as I read it! !